725 pages | 212 B/W Illus. Every year, an estimated 1.7 million Americans sustain brain injury. Long-term disabilities impact nearly half of moderate brain injury survivors and nearly 50,000 of these cases result in death. Brain Neurotrauma: Molecular, Neuropsychological, and Rehabilitation Aspects provides a comprehensive and up-to-date account on the latest developments in the area of neurotrauma, including brain injury pathophysiology, biomarker research, experimental models of CNS injury, diagnostic methods, and neurotherapeutic interventions as well as neurorehabilitation strategies in the field of neurotraum research. 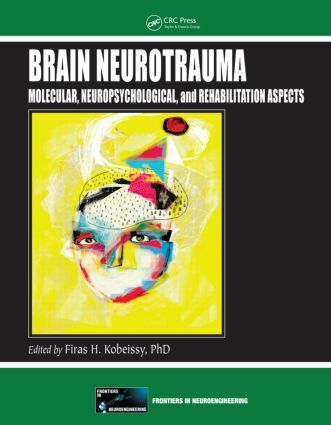 The book includes several sections on neurotrauma mechanisms, biomarker discovery, neurocognitive/neurobehavioral deficits, and neurorehabilitation and treatment approaches. It also contains a section devoted to models of mild CNS injury, including blast and sport-related injuries. Over the last decade, the field of neurotrauma has witnessed significant advances, especially at the molecular, cellular, and behavioral levels. This progress is largely due to the introduction of novel techniques, as well as the development of new animal models of central nervous system (CNS) injury. This book, with its diverse coherent content, gives you insight into the diverse and heterogeneous aspects of CNS pathology and/or rehabilitation needs. "As traumatic brain injury is now well recognized as a world health issue, this text is timely and well deserving in terms of a review or our current understanding of several topics related to traumatic brain injury and recovery of function. [It] is a "must read" for all investigators interested in the field as this text will cover the current advancements in scientific technology, clinical care and, most importantly, the undeniable value of translational research." "[An] appealing package of knowledge in the mechanisms, epidemiology, psychology, pathology, diagnosis, treatment and rehabilitation of traumatic brain injuries." "Broad in its scope and coverage, [the book]is sure to be an outstanding resource for anyone interested in the pathophysiology or treatment of military or civilian head trauma." Firas Hosni Kobeissy is an assistant professor in the Department of Psychiatry of the University of Florida McKnight Brain Institute and serves as the associate scientific director of the Center for Neuroproteomics and Biomarkers Research. He earned his PhD from the University of Florida and has published in the field of brain injury biomarkers, neuroproteomics, and neurosystems biology. Dr. Kobeissy’s current research overlaps the fields of neuroscience and psychiatry with a focus on drug abuse neurotoxicity and traumatic brain injury neuroproteomics. He has published more than 70 peer-reviewed papers, reviews, and book chapters as well as co-edited three books. He has also co-authored five U.S. patents. Dr. Kobeissy serves as an editorial member on several journals related to proteomics, neuroscience, and brain injury and has been a member on several study sections of brain injury and stroke. Stuart W. Hoffman is the scientific program manager of the brain injury portfolio in the rehabilitation research and development service at the U.S. Department of Veteran Affairs (VA) The portfolio is focused on promoting translational research that improves outcomes in veterans living with the chronic effects of stroke, traumatic brain injury, and its co-morbidities. He also represents VA/ORD on TBI research. In this role, he is the co-chair of the government steering committee for the VA/DoD Chronic Effects of Neurotrauma Consortium, as well as a member of several advisory boards for VA research centers, and serves on the congressionally mandated Traumatic Brain Injury Advisory Committee for the Veterans Health Administration. He received his doctoral degree in behavioral and molecular neuroscience at Rutgers University.